Update June 2018: we are pleased to announce the general availability of new performance levels and storage add-ons in Azure SQL Database. These new choices enable further price optimization opportunities for CPU intensive and storage bound workloads. Previously, the highest performance level for a single database in the Standard tier was limited to 100 DTUs and now increases by 30x to 3000 DTUs with a range of new choices in between. This update is similar to the announcement for increasing the database eDTU limits for Standard elastic pools. The new S4 – S12 performance levels provide price savings opportunities for CPU intensive workloads that do not demand the kind of high IO performance provided by the Premium tier. For IO intensive workloads, the Premium tier continues to provide lower latency per IO and an order of magnitude more IOPS per DTU than in the Standard tier. Previously, the storage size limit was a fixed amount based on the service tier and performance level. Customers can now purchase extra storage above this included amount for single databases and elastic pools in the Standard and Premium tiers. The decoupling of storage from compute reduces costs by allowing more storage without having to increase DTUs or eDTUs. Storage provisioned above the included amount is charged extra and billed on an hourly basis. 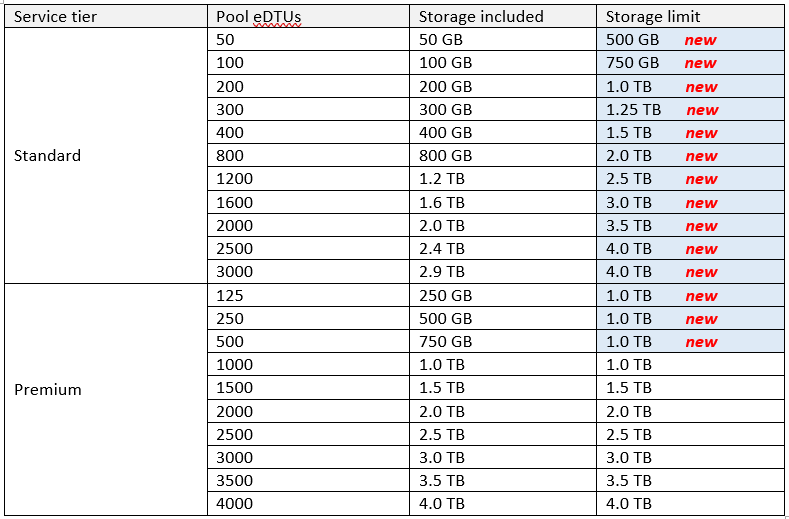 The total price for a single database (or an elastic pool) is the price based on DTUs (or eDTUs) plus the price for any extra storage provisioned. Storage for a single database or elastic pool can be provisioned in increments of 250 GB up to 1 TB, and then in increments of 256 GB beyond 1 TB. * Note that the general availability price for extra storage varies by region and goes into effect on August 1st, 2018. Usage prior to August 1st, 2018 is billed at preview rates which are 50% less than the general availability rates. Suppose an S3 database has provisioned 1 TB. The amount of storage included for S3 is 250 GB, and so the extra storage amount is 1 TB – 250 GB = 774 GB. The unit price for extra storage in the Standard tier is approximately $0.17/GB/month, and so the extra storage price is 774 GB * $0.17/GB/month = $131.58/month. Therefore, the total price for this database is $147.18/month for DTUs + $131.58/month for extra storage = $278.76/month. To learn more about the new performance levels and storage add-on choices available, please visit the Azure SQL Database resource limits webpage. And for more pricing information, please visit the Azure SQL Database pricing webpage.